If you don’t count the two Alien vs. Predator films – and, good Lord, why would you? 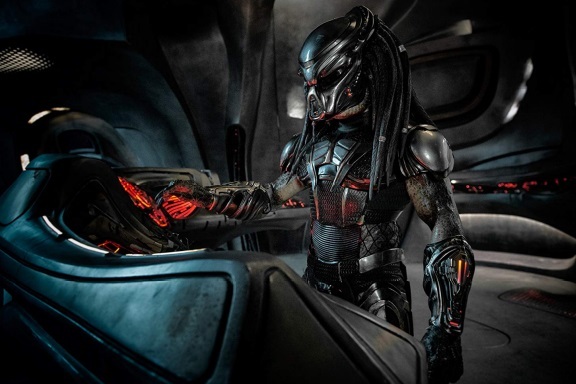 – the new sci-fi actioner titled simply The Predator is now the fourth in the series. For the record, it was thirty-one years ago at the height of Arnold Schwarzenegger’s action man popularity when the first of the four Predator movies were released. Eighteen since the last. Whether anyone was ever really waiting for more, only this weekend’s box-office will tell, but here it is, and frankly, it’s all over the place. Director and co-writer Shane Black was initially asked to do a reboot, but at Black’s insistence, either the fourth was to be a sequel, a continuance of the characters and these mandible wearing killer aliens, or he was out. Plus, it had to be ‘R’ rated; none of this watered-down, namby-pamby ‘PG-13’ stuff. He got what he wanted; an ‘R’ rated sequel. But when an earlier, rough-cut of the film was shown at test screenings, responses were disappointing. In fact, Black himself stated that the earlier version was maybe a little too dark. He nicknamed it The Night Cut. As a result, the whole third and final act was re-shot this past summer. And that might help explain a few things. To discuss the plot in any detail is to confuse. The setup and its development are so convoluted, attempting a synopsis to whet a fan’s appetite could end up doing the opposite. So, here’s the Readers Digest version. Try to stick with it. Briefly, a rogue predator alien crashes on Earth and is captured by government scientists for observation. A second and much larger alien predator follows with the intent of hunting down and killing the first. 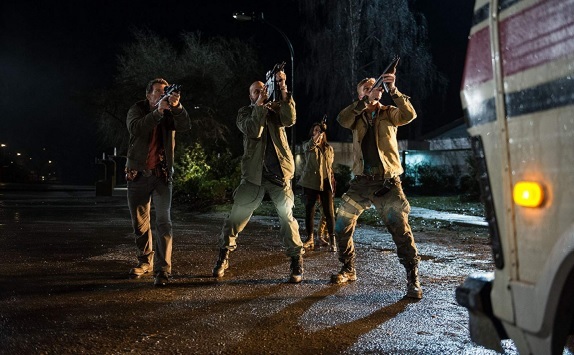 Then there are the secret government agents, led by the merciless Will Traeger (Sterling K. Brown) who orders his men to kill whoever witnesses these aliens and their crafts in order to maintain secrecy. He’s just as villainous as the predators. There’s even more. McKenna’s estranged wife, Emily (Yvonne Strahovski, best remembered from TV’s Chuck) is alone, acting as a single mom, raising their son, Rory (Jacob Tremblay), a bullied savant with issues who, as luck would have it, just happens to know how to translate alien languages. They’re dragged into the mayhem. 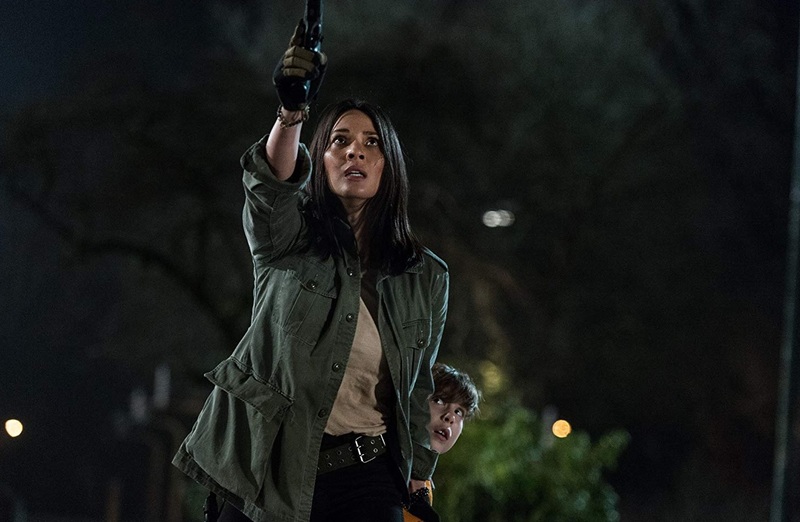 As is university science teacher and stargazer Casey Bracket (Olivia Munn) who is forced to join up with McKenna’s loons and keep running. “What’s the upside of me staying with you guys?” she asks. The obvious answer being, they’ll help her stay alive. 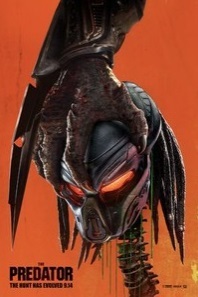 Either the predators will kill her, the secret government soldiers will kill her, or she’ll die in the confusing crossfire, not just between aliens fighting aliens, but soldiers fighting soldiers, who are both fighting aliens. At least there’s humor and a lot of it. Among all the running around, the fighting, the blood, the guts, the head rippings, and all the other body dismemberments, characters fire barbs faster than they do bullets. 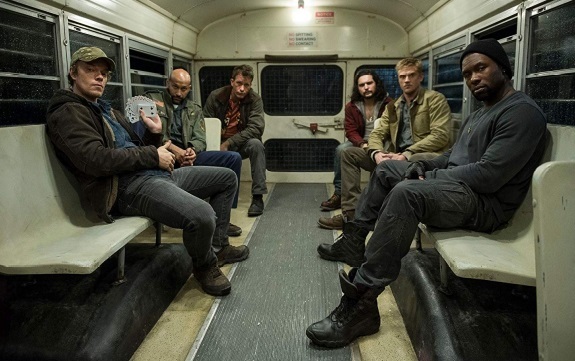 And they argue, including who’s right when it comes to the difference of meaning between the word ‘predator’ and ‘hunter.’ At one point, there are so many insults and quips lobbying around, the film has practically turned into an all-out comedy. “When this is over,” threatens McKenna to the ruthless Traeger, “You and me. We’re gonna dance.” “Got my shoes all picked out,” Traeger responds. But even though there’s promise in the first and second act, as long as you overlook how complicated everything is getting and just sigh, resign, and go with the flow, that lengthy final act is a genuine problem. It might have been re-shot in order to clarify things that confused test screening audiences, but the end result really doesn’t help. You’re left with all kinds of questions, like what happened to bad guy Traeger? What was his fate? Same with McKenna’s wife, Emily. Last we saw in her segment was an alien crashing through her house into the basement, with Emily scrambling to escape up the basement stairs. And then what? And does that final scene really indicate there’s more to come? With soldiers firing at soldiers, aliens fighting aliens, then turning again on the soldiers, it fast becomes incomprehensible. And ultimately unnecessary. It’s not uncommon to hear the complaint from ticket-buyers that Hollywood has finally run out of ideas. It’s said all the time. Certainly, after a summer of sequels, prequels, and remakes, with more remakes to come, it’s easy to argue that the only perceived risks being taken are with the smaller, independent movies. There is no end of examples. In playwright Annie Baker’s play The Antipodes (coincidentally, now playing at Tempe Center for the Arts by Stray Cat Theatre until September 22) a team of ideas people, looking for the perfect story, can’t think of anything that hasn’t been told before, adding to the well-worn adage that there are no new stories to tell. Watching this fourth Predator movie pretty much hammers both Baker’s point and the theory of disgruntled movie ticket-buyers home. And it still makes a mess of things.